Who Rules the Earth? emphasizes the need to change the rules that guide human behavior and shape how we interact with the planet. Drawing together research findings from across the social sciences, Who Rules the Earth? helps readers to “see” the social rules that pattern our physical reality and shows why these are the big levers that will ultimately determine the prospects for sustainability. Social rules are humanly devised constraints that, like invisible threads, tug at us as we go about our daily lives and make coordinated social activity possible. We know them by familiar names like city ordinances, product design standards, purchasing agreements, public policies, cultural norms, or national constitutions. Who Rules the Earth? takes the reader on a series of journeys, from a familiar walk on the beach to a remote village deep in the jungles of Peru, revealing the institutional underpinnings of contemporary environmental problems and showing that significant change is well within our grasp. How do different societies respond politically to environmental problems around the globe? To answer this question requires cross-national comparisons of political institutions, regulatory styles, and state-society relations. The field of comparative environmental politics uses theoretical insights from comparative politics to better understand substantive concerns of environmental policy. This book defines the new field by bringing together leading scholars on social movements, green parties, federalism, the European Union, corporate social responsibility, political instability, democratization, authoritarian regimes, management of local commons, and comparative public opinion. Contributors apply concepts and methods from these areas to concrete problems ranging from water scarcity to climate change and the disappearance of tropical forests. 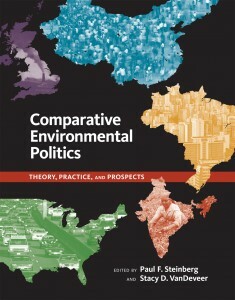 The book shows how environmental issues and politics are connected around the globe, and is ideal for use in upper-level and graduate courses. Winner of the International Studies Association’s Harold and Margaret Sprout Award for the best book in international environmental affairs. In the absence of world government, effective national policy is essential to the success of international environmental initiatives. Yet research on global environmental cooperation has proceeded with little understanding of how policy change works in developing countries, where most of the world’s people, land, and species are found. This book provides a theoretical framework to explain the domestic responses of developing countries to global environmental concerns. 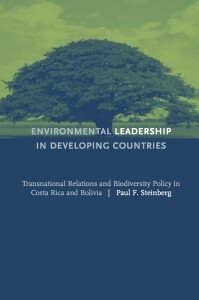 Drawing on extensive field research, he traces the evolution of public policies to protect biological diversity in Costa Rica and Bolivia over the past four decades, to understand how these countries emerged as leaders in tropical conservation and how international institutions might support similar outcomes in other countries. Environmental Leadership in Developing Countries explodes the myth that developing countries are too preoccupied with short-term economic growth and material survival to devote attention to global environmental concerns. Instead it offers a nuanced account of complex, decades-long efforts to create effective institutions, and analyzes the relative roles of foreign and domestic actors in this process.